In the first part of May the danger of an uprising in the town was driven away because of the quick occupation of the offices of the Indonesian Town leadership and police. From the convincing evidence it had become obvious that an action was being planned in the milieu in connection with an attack from outside. Surveillance showed that this enemy in the back had been cleared away. In half an hour and all buildings, officials, and archives were in our hands. All personnel were arrested for the time being. Most of them were released after an interrogation. This blow brought a noticeable improvement in the situation in the town. Outside the daily patrols and weekly bigger actions made a vacuum in, which the republicans did not, dared to stay. Shelling by mortars and artillery nevertheless continued to be the order of the day. Especially late in the evening the enemy had a habit of making a few quick salvos and then ran away before our artillery got time to answer. The casualties were only among the Indonesian inhabitants who found little protection against the projectiles in their light build huts. A Dutch soldier from Europe knew that their positions were made to withstand such a bombardment with its wounded and dead. Every front had its “left” flank 2-7 had “Stoomwals” on the way to Demak, for 1 R.S. it was “ Hill 13” Srondol was the troublesome kampong for 2-13 and the 6th still got more troubles in Toegoredjo. Until then the opponents had had withstanding to attack the town in greater numbers. It stayed by the shelling from close by. The bulan puasa in 1946 should bring a change to that. Boeng Tomo did his best from his secure place in Djokja to make his supporters do their best and to do this he made great use of their religious feelings. In thunder speeches he promised a republic in Semarang on its birthday of one-year existence. On 17th August it was his plan to host a parade at Bodjong. The Dutch soldiers should be pushed back in the sea and the officers in particular have the privilege to be beheaded (who had it in their hands?) and their bloody heads be put on bamboo sticks as decorations on the parade ground. It did not look good for the garrison in Semarang. On 4th August early in the morning the execution of the plan started. Following the book it started with an attack with artillery and mortar shelling, which was supposed to make us soft and break our moral. That did not happen but it did make us ready and suspicious in time in our positions. Almost at the same time the airfield, the Veda position, Djatingaleh and de Gombel were attacked. At de Gombel the artillery could make an SOS fire but else it took a little while. It was only because it in the start it was difficult to determine the intentions of the opponent. We had always expected him to think on the tactical qualities, which he did not have and no one expected that a few thousand young men would attack alone without coordination, a thorough plan, without supplies of supplement monition, without heavy weapons ands contact with the units coming after and attempt a daring conquest of Semarang. However, it stayed with attacks and still the battles were firm. Under cover from the now for the first time in action coming tanks the companies went forward and cleared the opponents. Following republican sources died 800 men here. On our side were 7 dead including the crew on the on the airfield stationed B-25 who furiously fought against the superior attackers who assaulted the airfield and although in spite of a defect in the motor it started to gain height only to crash in the terrain of the airfield. A rescue team moved out without taking care of the danger but could only recover the bodies. The artillery worked the whole day helped was requested from everywhere and given right away. The way they for instance laid the fire in front of the de Gombel position was so exquisite and precise. It was so well done that the attack went dead. The attack was repulsed with success and everyone of course stayed on guard and the Commander of the Brigade continued to give orders to the troops. It was a little irritating to stay in place and conquer the wish to go and party. But no one knew what could come. Precise a week later on 11th August it was all repeated although in a smaller scale. Once more a few thousand youngsters stormed the town some of them even believing it had been conquered the Sunday before during the New Tjandi week. Only this time it was the reaction was faster. The troops had been alarmed earlier and did not wait until the attack came but left their camps right away and attacked. At most places it was not even necessary. Twenty minutes after the sound of the first shoots they retreated in disorder followed by the rest. Like the first time all kinds of fire weapons had been left behind in the terrain outside the town. First the shoes, which had been taken of to make the retreat faster, then monition of all kind, hand grenades, small packets of rice and fireworks which it might have been planned to use to misguide us. Although we were pleased with the new victory it was difficult not to feel sadness with these youngsters who were forced into the death without a chance to do anything. Everybody prepared for a new attack. It never came. The enemy put better troops at the front that was even less afraid to die and was determined to take hill 13 in an action on 12th August. And to us who were also strong in out believes they showed to be a difficult nut to crack. In this way went the month of August with intense patrolling and continual alertness. 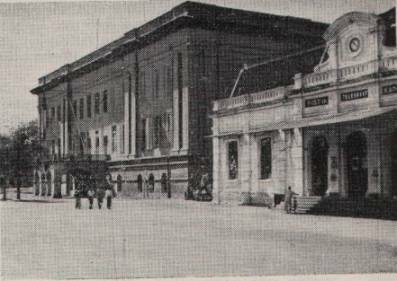 The continual alertness naturally gave an opportunity to make clandestine excursions and in many cases it also helped on the self-activity of a lot of units, which in this way learnt to amuse themselves and each other. The political game, which was played in Batavia at the same time, was only shown little interest. The troops did their work not in the first place, because the soldier saw the necessarily or understand the politics, or what the higher interest was. He looked first of all on his nearest surroundings and saw all the misery and disorder: the slim figures of the republic from which he looked for shelter in Semarang, the terror, which he with his own eyes saw. From the beginning there was a great understanding for the Javanese and it will be rightful to say that the soldiers in their work only had their welfare in the eyes. When they after an attack searched the adjacent kampongs they heard crying from a hut, and when they went in they saw a little girl with her legs cut of, because her crying should make such an alarm that the attackers could hide there. It could not be shown more clearly that order and justice were missing as well as an official explanation in the newspaper. No matter how you looked at the Indonesian question you had to look at the human side too. This was the title we gave our town at the time and between ourselves we spoke about the besieged fortress. By now of course you know the town was not surrounded on all sides. The sea was free and the air open. Although there was not much sea or air traffic. In the start it was a big event every month when the supply ship arrived and the contact by air was no more than a single plane every day, which for the most kept in contact with Soerabaja. On land there was no traffic to the interior; the few citizens who brought their products to the market in Semarang where they only hardly could solve the food problem of this area so rich on people. So without hesitation you can say that all the food had to be supplied from outside by ship. In the month of July 1946 the import from the inner of the land raised considerable. The possibility to buy cloth in Semarang in connexion with the next Lebaran made them forget the fear of being arrested by the Polisi Tentara It was also a sign that the front was more or less stabilised. Because of the constant patrolling there had been made a width area around town as said earlier where only our troops could go freely. Yet in other ways Semarang was isolated. The shin that this far away and difficult to reach place, not to mention for the countless press representatives who travelled the archipelago. And…… if anyone came he did the town in one day. Sure enough the garrison was paid a visit by the Lieutenant General Governor, the Commissioner of Police and the Commander of the Army General Spoor. But when these people were in town all soldiers were forced to show great energy. And had to tell about what went on everywhere. 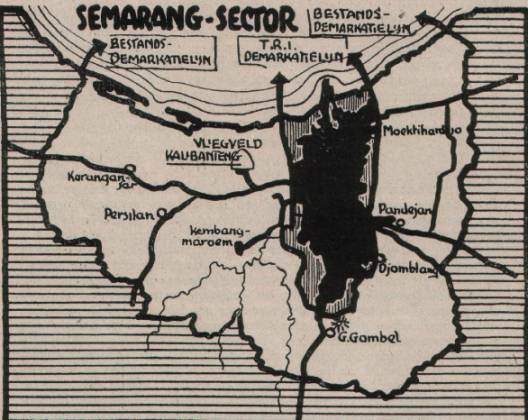 And when with the attack on 4th August the war around Semarang became so important that the town reached the news. The reports were so exaggerated that nervous letters from elders and family members showed signs as: “I wish that you had not been encouraged by us”. Instantly after the attacks in August the Brigade kept the initiative. I speak about the action at 12th August the action “Jen”, which was directed against the east. On 30th August the action “Lekas ” brought the troops into enemy territory to the south and southeast. These actions in the beginning of August meant that the fighting spirit was blazed up for awhile: “Our troops meet no opposition and it was only time, which forced them to retreat”. Weather or not it was the mobile reserve in the start of August, which so clearly had demonstrated so clearly during the enemy test. The Commander of the T-Brigade decided to pull one of the battalions out of its guard duties and concentrate it as a whole. For this task the first battalion Stoottroepen was assigned. It was stationed in the former military hospital in Djatingaleh. One company stayed behind for the time being at the post Veda and for this came under the tactical command of the Commander 2-13 R. I. 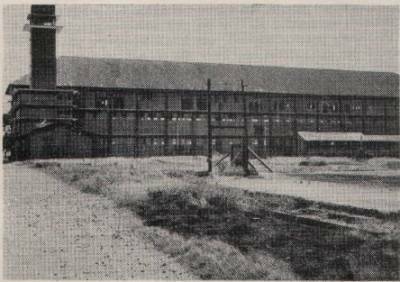 The Stoottroepers operated daily in company sized units at all fronts. When undertaking bigger tasks they made a call on the other battalions. In this way the west front was stabilised in September with the help of 2-6 and 2-13. The airfield lay still in the fire line. It happened time and again that mortar grenades fell near the runway. Because of the circumstances it was of course impossible for the Brigade to get the air support it needed because of the lack of planes. Therefore to make a change in these circumstances the front was widened to the west through a series of actions. It was the first and only enlargement of importance. Kampongs like Persilan, Karanganjar and the old airfield Kembang Haroem was secured and not like other places evacuated. At every one of them a company from the 2-6 R.I. was stationed to secure the airfield. The enemy was not without impression because of this appearing. Reports showed that commanders excused themselves with being up against superior forces. Anyway it did not depend on people but on perseverance, courage and organisation. The first night a company from another battalion stayed behind to cover the activities. After this it was up to 2-6 itself to find out what to do. It was only because of luck that these outposts outside Semarang, which it had been easy to cut of from behind but only serious threats: Especially Karanganjar and Persilan were nearly daily shelled by mortars, which of course did no good to the nerves of the guards that is obviously. In the meantime the Commissioner General was working on an agreement with the republic. The result of this was the decision to make a truce to make a better atmosphere for negotiations. It started on 14th October 1946. In connexion to this a demarcation line had to be made between the Dutch and the Republican troops. Behind which they had to stay and they must not shoot at each other. There was no experience from former agreements and many were pleased that the fighting was over. They hoped that the peace and mutual trust should return. The Commander of the T-Brigade gave orders that they were not to cross a line two kilometres in front of their positions. Everyone who lived during this period know that this order was followed strictly but a few times it was tried to come in contact with the opponents to finally meet him. It was not before at 15. February 1947 that the truce became effective for real. This truce cost us 26 dead. After the signing of a plan in Linggadjati on 25th November the situation seems to become better. Also the Republican Commanders got the task of making contact. On 6th December a first meeting was held in the totally destroyed kampong Ngesrep south of Gombel. On the Dutch site on behalf of the Commander of the Brigade as chairman of the commission was the chief of staff General major Buurman van Vreeden and on the site of the Republicans it was the chief of staff T.N.I. General Oerip, Colonel Soenarto Commander of the Semarang front. Adjutant Berkhout and Sergeant Kruk were the first to try out these new abilities in the form of truce discussions. Later on they were frequently asked to return. The first agreement was a failure. The ice of the opponent was impossible to accept and had nothing to do with realities only with the regulations from the “Joint Truce Committee” in Batavia. The Republican Commanders demanded a retreat to within both the Bandjircanals, clearing of de Gombel. The airfield must be used but had to be under Republican guard. Accepting these demands would mean suicide for the garrison and was just like handing over the town to the opponents on their terms. The Dutch expectations were very moderate. We only wished to make such circumstances that the town (not even the military positions) should be secured against shelling by artillery and mortars. There was no talk about the waterline from Oengaran or electric light from Toentang and this would have helped the Indonesians in the town the most. Persuading on the site of General Oerip did not make it better. The farther most concession was “farther considerations”. On 8th December the second meeting was held without Colonel Soenarto. He sent the message that he still kept his opinion. The mentioned B-25 is B-25J-10NC ”Mitchell” serial number N5-230 (3). It was made available for the Netherlands East India (NEI) Forces in Australia in 1944 as 43-28184. On 27th July 1944 the serial number was changed to N5-230 on delivering in Canberra. Where later in the year it went to the 18th Squadron in Batchelor. On 10th July 1945 it was transferred to the NEI-pool in Canberra and in December 1945 went with 18th Squadron to Balikpapan. On 4th August it was shot down over Kali-Banteng, Semarang (6 killed). (source “De Nederlandse “Mitchells”). A second accident with a fatal outcome happened in Semarang. During heavy assaults on the airfield Kalibanteng on 4th August 1946. N5-230 was lightly damaged during take off by enemy fire but continued on its mission – harass of the Indonesian attackers – which it did until motor problems forced it to return to Kalibanteng where the problem was fixed. Shortly after taking off again it was seen crashing and start to burn. The whole crew was killed in this accident (source De Militaire Luftvaart van het KNIL 1945-1950). This note was made with the kind help of Drs. W. H. Lutgert deputy head of the Dutch Air Force Historical Unit.